Anika sees a lady in black saree and ringing a bell. She gets scared and turns on lights but there is no light. She runs and cries. Everything gets breaks down and she runs upstairs. Shivay comes and asks Anika to open the door. Anika hugs Shivay and says there is someone. Shivay says there is no one and you should calm down. 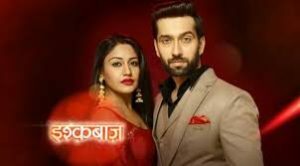 Shivaay and Anika meet new people. Lady gives sweets to Shivaay and Anika. Anika says she will set barbeque but Shivay denies. Anika insists. Anika goes and thinks how this machine works. She gets amazed and thinks how to do this and now impression will be destroyed. 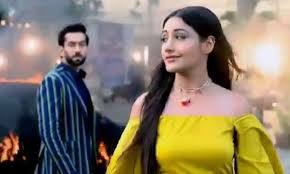 Anika plays with sticks of barbeque and Veer sees her. He goes to Shivaay and says Anika doesn’t know cooking. Shivaay says she is trying because of him. Anika sees the video on youtube but doesn’t get anything. Veer goes to Anika and tries to help her. Anika says how to use this. He helps her and directs her to do everything. Anika goes into the kitchen and sees a lady in black saree sitting right in front and she gets scared. Anika comes in tension and thinks why Veer was unable to see that lady and where is that lady now. Anika continues to do bar be que and keeps vegetable on fire and suddenly a blast occurs. She panics and calls Shivaay. Gauri meets Tina. Tina acts blindly. Gauri says I know you can see everything clearly. Gauri asks about how this red color came here. Tina says painting is my hobby and I used to do that. Gauri says I am thinking that you can see everything. Tina says I am already tensed and don’t let me do anything wrong. Tina says leave my room. Gauri says this is not your room. You should go to your home and leave bothering us. Tina says I have suffered a lot already and lost my eyesight so she should not humiliate her. Gauri takes up something and thinks to throw it. Tina thinks what Gauri is about to do and she has to face everything otherwise mission of her sisters would become fail. Anika asks Shivay to come. They all go to the kitchen. Everything seems normal. Shivay says there is no problem. Anika says there were a blast and vegetable burst. Anika panics and says please trust me. Shivay says its okay be normal. Veer says thank god Anika is fine. Anika cries and says everything has been spoiled because of me.